So i thought i'd put together a Christmas makeup look for you all. I know that i'm not the best at makeup and i'm learning new things about it everyday, but this is probably the look i'll be wearing on Christmas day, so i thought i'd share it with you. Below is some close up photos of my makeup and also photos of the makeup i used with details. 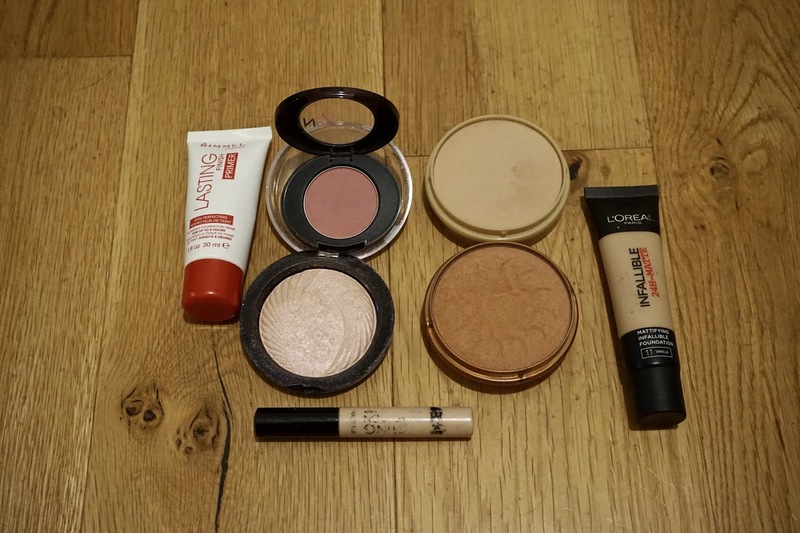 (left to right) Rimmel Lasting Finish Primer, No7 Blusher in Soft Damson, Makeup Revolution Vivid Baked Highlighter in Peach Lights, Collection Lasting Perfection in Fair, Rimmel Stay Matte Pressed Powder in Silky Beige, Rimmel Natural Bronzer in Sun Glow, L'oreal Infallible 24 Hour Matte Foundation in Vanilla. So i start of by applying the primer to my face, and once that's sunk in to my face, i get my foundation brush and start buffing in the foundation. My favourite foundation at the moment is the L'oreal Infallible Foundation. It drys matte which is perfect, and i always get told it makes my skin look great when i'm wearing it, which is great! 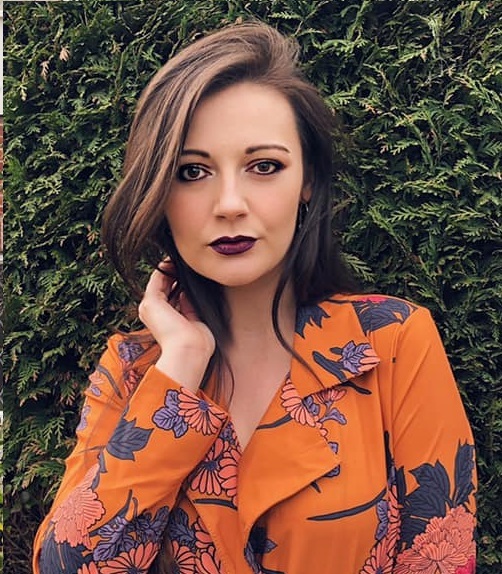 Once my foundation is applied, i get my trust Collection Lasting Perfect Concealer and apply that to under my eyes, down the centre of my nose, and my cupids bow. If i have any blemishes i apply it to them as well. I use my Real Techniques Beauty Blender to blend that into my skin. If you haven't tried this foundation and concealer, i would 100% recommend it. Once the foundation and concealer has blended into my skin, i apply some blusher to the apple of my cheeks using a blusher brush. I don't use too much of the blusher as a little goes a long way. 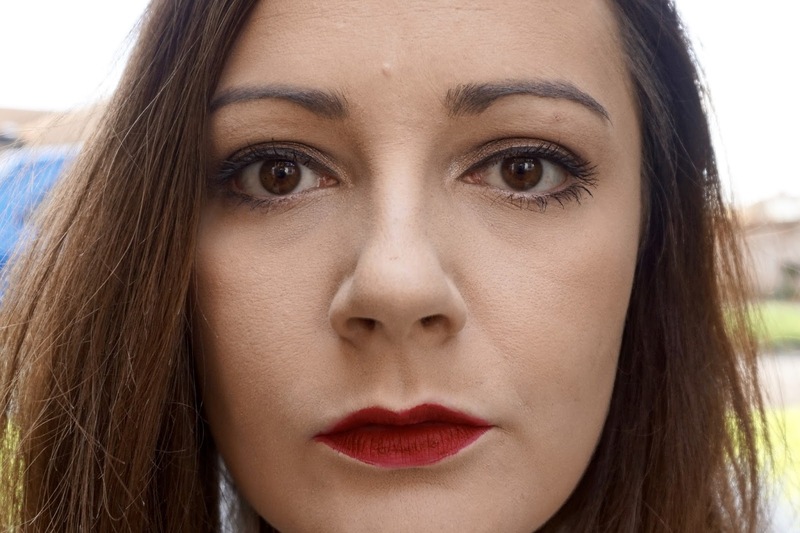 I then apply the highlighter to under my eyes and to my cupids bow, which really highlights them. Then with my powder brush, i take a little bit of bronzer and brush it all over my face. Then i use the powder and do the same thing as i want to stay matte. 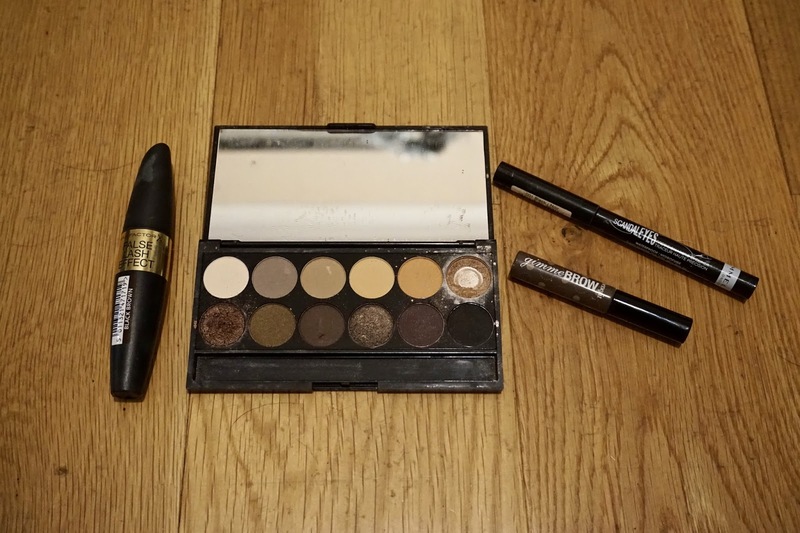 (left to right) Max Factor False Lash Effect Mascara in Black/Brown, Sleek I Divine Eyeshadow Palette in Au Naturel, Benefit Gimmie Brow Eyebrow Gel in Medium/Deep, Rimmel Scandaleyes Micro Eyeliner. I start off by doing my eyebrows. I use the Benefit Gimmie Brow on my eyebrows as i feel like it does the best job for me. I spend a few minutes making sure that al my eyebrow is covered in the gel and all the hairs are sitting nicely in place. I normally will get it underneath my brows so i use a Q-tip to get any bits of the gel that aren't meant to be there. I then used the bottom left hand corner eyeshadow all over my lids which i think looks really nice, and then in the inner corner i used the top right eyeshadow. After this has all been applied neatly i take the Rimmel liner and line my upper lid. I can't do winged eyeliner without making a mess, so i've just lined the lid. I then take my mascara and apply it to my top and bottom lashes. I start from right by the lid and move it left to right on my lashes to the end of them. I'll of usually managed to get it on my eye lid, so i take a Q-tip and get the bits of mascara that are on there, and then dab a bit of eyeshadow in that place as the Q-tip will have removed a bit of it. Lastly i need to apply a colour to my lips. As this is a Christmas makeup look, i think it had to be finished with a red lip. 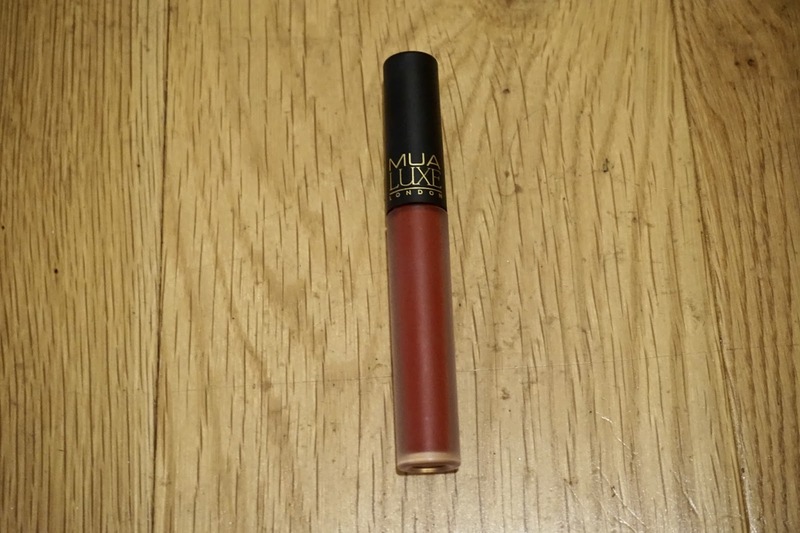 This lip lacquer from MUA is really easy to apply and has a dofer (i think that's what it's called) applicator. I start by outlining my lips with the lip product first, and do a cross when my top lip is in line with my cupids bow. I then start to fill in the lips. This lip lacquer really stains the lips and i'm quite messy, so if i have gone off the lips i will use a Q-tip dabbed in a touch of water to get the product which isn't where it's meant to be. 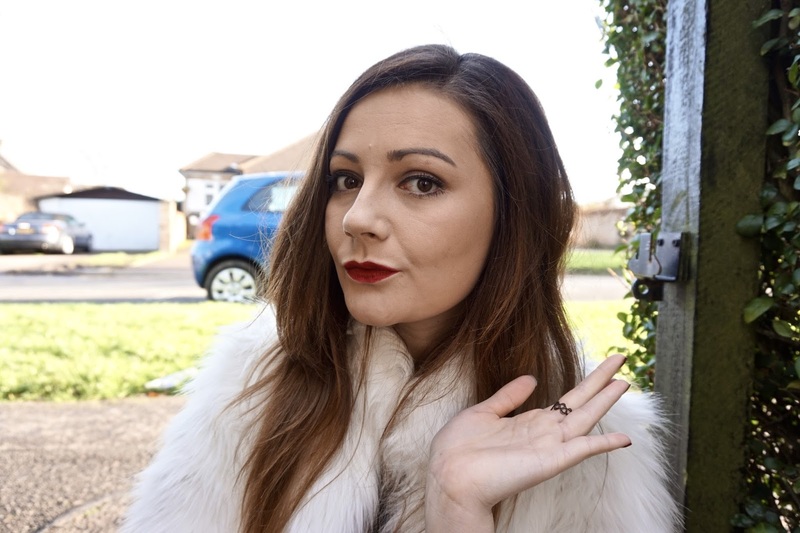 So this is my Christmas makeup look which i hope you enjoyed and has maybe given you some help into what you're Christmas makeup is going to be.